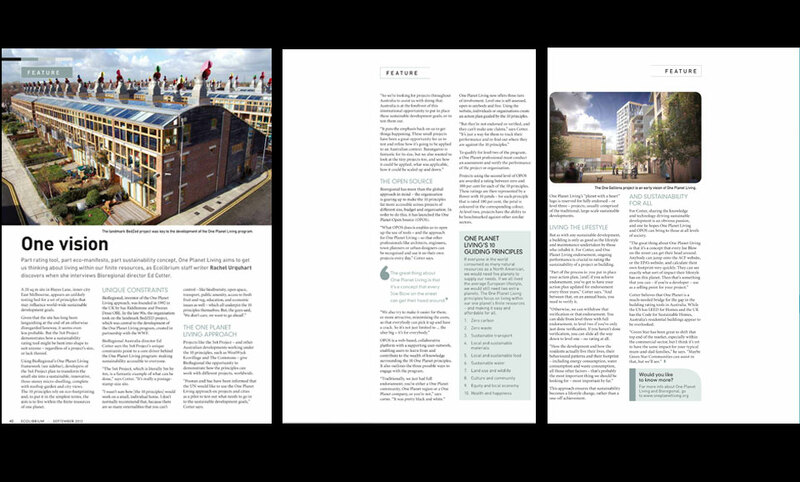 With the ever increasing wave of interest in ‘Smaller Living,’ WellBeing Magazine engages with a series of projects striving for a sustainable lifestyle and connecting with their environment on a personal level. Questioning both the integrity and the practicality of downsizing, WellBeing writer Jo Hegerty, challenges our sizist natures and asks Ralph Alphonso whether less can in fact be more. Ralph Alphonso is showing that individuals can reduce their impact in a big way, with some planning and commitment. 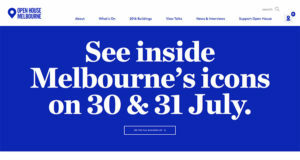 On a 4 x 5m Plot down an East Melbourne laneway, Australian Geographic photographer Ralph Alphonso is attempting to build a liveable apartment on a leftover slab of land. 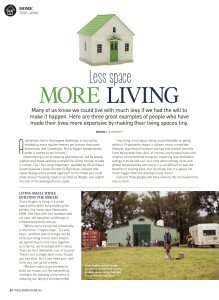 “I was going to build a garage or an extra room but I live here by myself and I thought, ‘Do I really need this space? 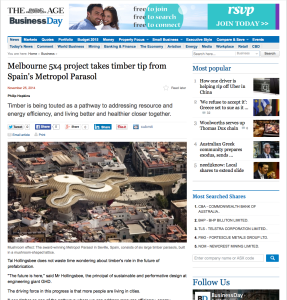 '” he explains from his current living room, which has twice the floor area of his soon-to-be-built home. When he looked for examples of carbon-neutral buildings for inspiration, he struggled to find one locally that looked at the whole picture – including where products originated from and -lifestyle. “I found it frustrating. A lot of architects were talking about what could be done, but I wanted to actually do it. Waiting for someone else to go first isn’t my thing,” he says, with a smile. constraints imposed by the site: a plot measuring 5m by 4m. Nestled between existing buildings, a prefabricated residential dwelling to house two people will rise three stories from the plot. It will be an example of how to build and live in a small space. It’s an approach that is familiar in urban populations with high densities, such as Hong Kong, Tokyo, and interestingly, Warsaw, where architect Jakub Szczesny claims to have built the world’s narrowest house, which is 122cm at its widest point. 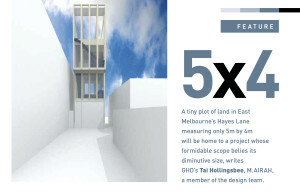 In the current issue of Australia Geographic Magazine a feature article ‘Six Global Megatrends,’ has included the 5×4 Hayes Lane Project as an example for one of the trends. 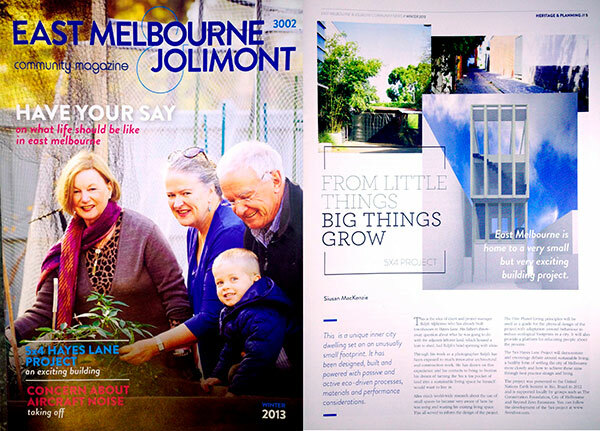 The 5×4 Hayes Lane Project has just been featured in an article by Siusan MacKenzie of the East Melbourne Jolimont community magazine. The project has the support and interest of the community. Click on the image below to view the full feature! 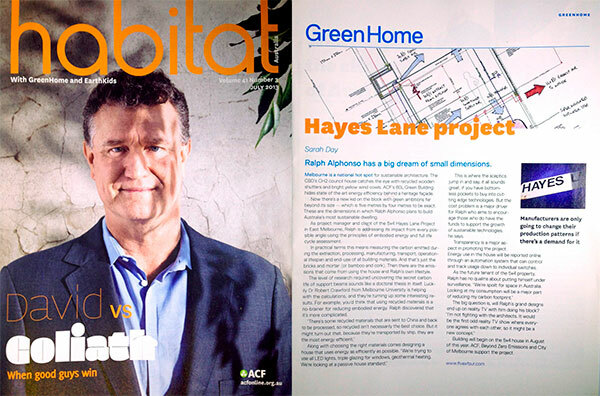 The 5×4 Hayes Lane Project has just been featured in an article by Sarah Day of the habitat magazine published by the Australian Conservation Foundation. Part rating tool, part eco-manifesto, part sustainability concept, One Planet Living aims to get us thinking about living within our finite resources, as Ecolibrium staff writer Rachel Urquhart discovers when she interviews Bioregional director Ed Cotter. 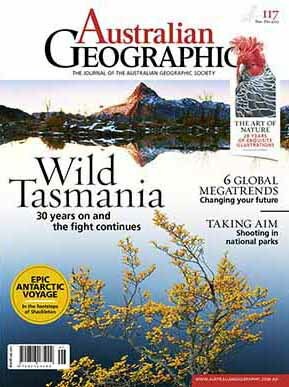 Ecolibrium is the official journal of AIRAH. It is read by over 10,000 professionals in the HVAC&R industry every month, and features the latest industry news, case studies on major projects, technical papers, information on the latest professional development opportunities available to industry and more.